It has probably happened to each of us at some point. 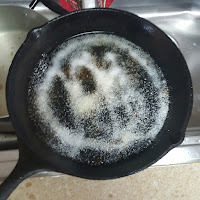 You get a nice cast iron skillet seasoned to perfection and someone comes behind you and cleans it with soap or a degreaser. 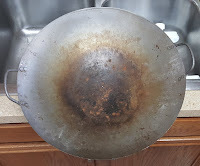 So how do you clean a cast iron skillet, or in this particular case, a carbon steel wok? 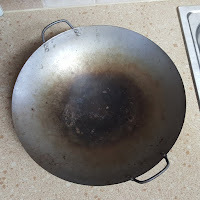 I reached for my wok the other day and it was nasty. It was dust covered, had food residue, probably some dog hair, and then towards the bottom, rust. A lot of people would probably throw it out at this point. But not me, I reached for the kosher salt. First, I rinsed the wok in some water to remove as much of the dirt and grime as I could. I left about an inch water in the bottom of the wok and added some salt. The salt is going to act as an abrasive agent on the metal. Using a paper towel or rag, rub the salt around to remove the dirt, food and rust. When you're done, apply a thin coating of mineral oil to combat the elements. I like to let it sit on the stove to let all of the water evaporate off before I put my wok or cast iron skillets away. 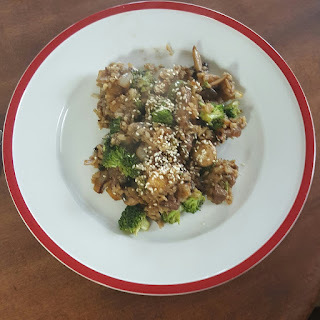 I was pretty excited to have a clean wok, so I made some stir fry that ended up as a fried rice. I checked out a few recipes for inspiration and got started. Heat up the wok and add 1 Tbsp of peanut oil. Toss in the skirt steak and quickly stir around with a spatula. When the skirt steak is cooked through, add the butter and garlic. Toss around to coat and remove the skirt steak to bowl. Add all veggies, minus the mushrooms, and stir around until the color changes. Add the mushrooms and give a quick stir. Add the skirt steak back in and stir to mix. Sprinkle in some white pepper and some soy sauce. At this point, you can leave it as it is and enjoy it as a stir fry, or add the rice and make a fried rice dish. If you go the rice route, add it a little at a time so you stir it in and avoid it sticking. Once the rice browns a little, it's done. Plate it up and add some sesame seeds on top and enjoy. 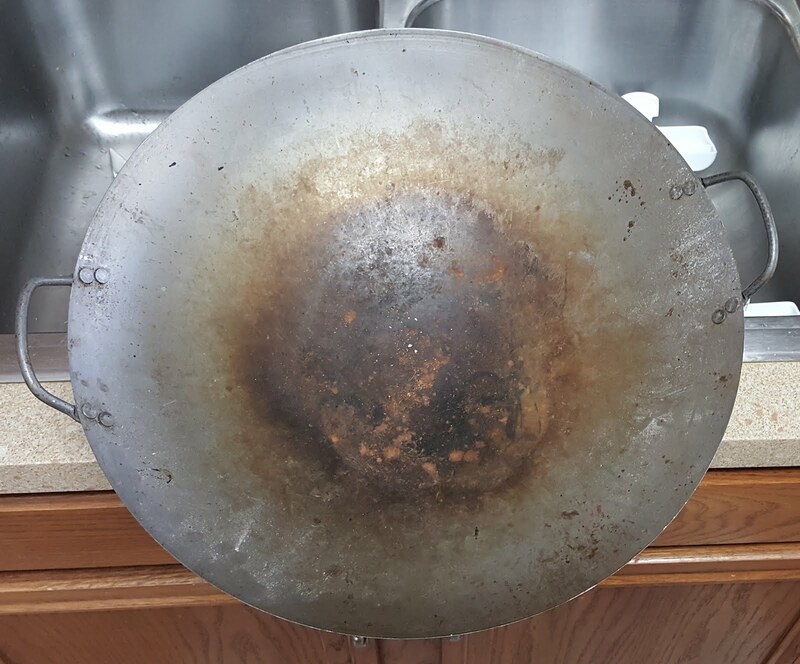 Once it cools, be sure to clean your wok or cast iron skillet as described above so it doesn't end up in the same neglected state as mine. I use course salt in my cast iron skillets too, it works so well. The fried rice looks and sounds tasty. Good post. Thanks for sharing.